Top: ASOS (sold out) similar here | Jeans: Zara similar styles here and here | Heels: Jeffrey Campell also here similar style here | Bag: Target | Sunglasses: Quay Australia | Watch: Charming Charlie | Lipstick: MAC in "Creme Cup"
Okay, some people probably think these are the ugliest jeans ever! But, I am in love! Gimme all the flare jeans! They are suppose to be a "boyfriend" fit rather than a skinny jean fit. My favorite is the cuffs at the bottom. They are suppose to also be "cropped", but because my legs aren't long the fit a little longer (but I still love them). I paired it with a basic white tee. 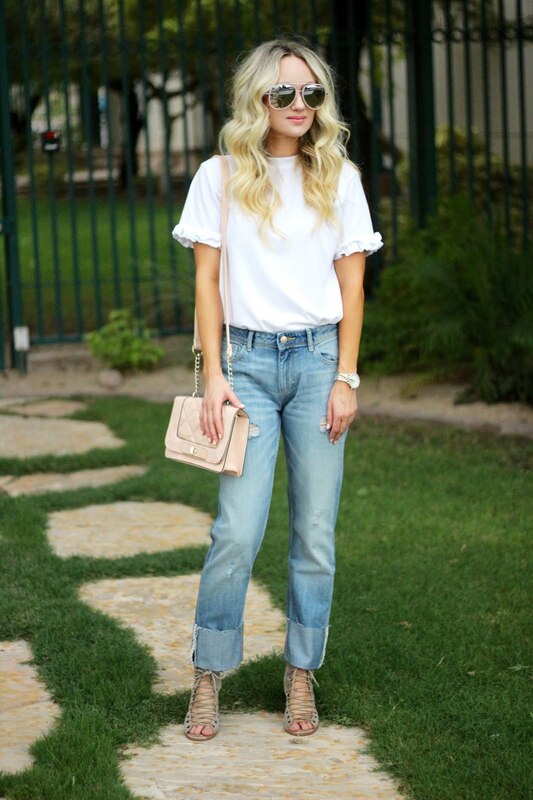 Because the jeans are flare like you want to keep your top simple.